Can you briefly introduce yourself, and about your projects. What is TCP/UDP. Difference between both. How TCP handles reliable delivery, flow control and congestion control? Explain OSPF, RIP and BGP protocols in details. What data structure you will used for routing table in optimize way. In an array, how will you find the elements whose sum is "S". Tell all the steps you will do. 1) Sort the array in ascending order. In case of crash dump for a process from a customer, How can the line number be known wherein the problem was caused? What are you looking for in "Broadcom". Why do you want to join Broadcom. What is the effect of egress scheduling configuration on QoS? A processor will have processing word length as that of data bus size. On a 32 bit machine, the processing word size will be 4 bytes. Data structure alignment is the way data is arranged and accessed in computer memory. It consists of two separate but related issues: data alignment and data structure padding. What will be the output of this code fragment. What would be the output if it's union? How would you identify which process has crashed in customer environment, if there are multiple process crash at same time? How to identify deadlocks? When should we use multithreading? and What is virtualization? Can you Design an algorithm for below. There's one input message queue where can we read from, and there is three output message queue that you can write to. The message has alphanumeric key value. There could be duplicate key values coming out of the input queue and once we put a key value say "ABC1234" to output queue-1, whenever we get a key value ABC1234 it should go to queue-1 only. Also, we should try to balance the load among the 3 output queues. Why does BGP uses full-mesh ? Difference between OSPF and RIP, which routing protocol can be used if there are 50 nodes in each area? What is network/subnet mask. Explain how a host A sends a message/packet to host B in below scenario. (a) When both are on same network. (b) When both are on different networks. Explain which layer takes routing decision and how. Observe that for the scenario (a) both x and y are the same so that Host A understands that destination is in the same subnet and now it sends an ARP broadcast to get MAC details and sends the packets directly to the destination host. Now let's consider scenario (b) where x and y are different. So it is vivid that destination host is not in direct reach and hence source host forwards the packet to default gateway router .now the default gateway router acts as the source and the same manipulation is done here. The destination address remains unchanged in the routing process. Write a code to swap every two bits in a byte. extracts the high bit position and shifts it to the low bit position. similarly extracts the low bit from each pair and shifts it to the high bit position. 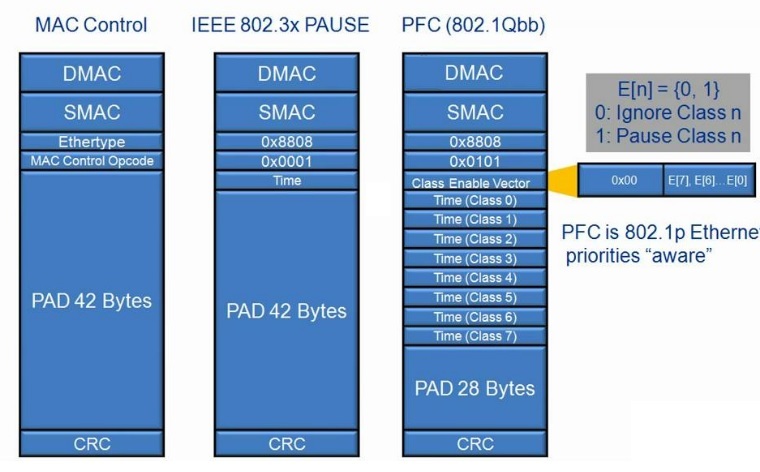 What is 802.1Qbb Priority Flow Control (PFC)? Priority-based flow control (PFC), IEEE standard 802.1Qbb, is a link-level flow control mechanism. The flow control mechanism is similar to that used by IEEE 802.3x Ethernet PAUSE, but it operates on individual priorities. Instead of pausing all traffic on a link, PFC allows you to selectively pause traffic according to its class. Standard Ethernet does not guarantee that a packet injected into the network will arrive at its intended destination. Reliability is provided by upper-layer protocols. Generally, a network path consists of multiple hops between the source and destination. A problem arises when transmitters send packets faster than receivers can accept them. When receivers run out of available buffer space to hold incoming flows, they silently drop additional incoming packets. This problem is generally resolved by upper-layer protocols that detect the drops and request re-transmission. Applications that require reliability in Layer 2 must have the flow control that includes feedback from a receiver to a sender regarding buffer availability. Using IEEE 802.3x Ethernet PAUSE control frames, a receiver can generate a MAC control frame and send a PAUSE request to a sender when a specified threshold of receiver buffer has been filled to prevent buffer overflow. Upon receiving a PAUSE request, the sender stops transmission of any new packets until the receiver notifies the sender that it has sufficient buffer space to accept them again. The disadvantage of using Ethernet PAUSE is that it operates on the entire link, which might be carrying multiple traffic flows. Some traffic flows do not need flow control in Layer 2, because they are carrying applications that rely on upper-layer protocols for reliability. PFC enables you to configure Layer 2 flow control selectively for the traffic that requires it, such as Fibre Channel over Ethernet (FCoE) traffic, without impacting other traffic on the link. What will be the packet format of PFC control packet. 64-byte MAC control frame is used by both IEEE 802.3x PAUSE and PFC. In both cases, numeric values can be used to describe the requested duration of PAUSE. However, since PFC acts independently on eight different CoSs, the frame describes the PAUSE duration for each CoS. The PAUSE duration for each CoS is a 2-byte value that expresses time as a number of quanta, where each represents the time needed to transmit 512 bits at the current network speed. A PAUSE duration of zero quanta has the special meaning of unpausing a CoS. Typical implementations will not try to guess a specific duration for PAUSE, instead relying on the X-ON and X-OFF style behavior that can be obtained by setting PAUSE for a large number of quanta and then explicitly resuming traffic when appropriate. When do you need to enable QoS? When do you need to enable PFC? What is Flow Control (Global Pause)? In given a binary tree T, traverse the tree and print all the nodes available on the given level L.
Write a function to sort the linked list, given head of the list as parameter. Condition: No extra memory is to be used. What is a wildcard mask, and how is it different from a netmask? Write an algorithm for a restaurant such that, whenever a person empties their plate, the hos has to be notified also when the number of persons waiting exceeds the threshold, host should receive a notification of this. Write a code to implement memcpy. Write a code to implement 2D array dynamically in C? Get the number of rows and columns from the user. Tell me a situation/ issue where you identified a problem on your own, and drove to resolve it. Tell about most difficult team project u have worked on.